Although Thai and Japanese curries exist, "curry powder" is a generic term for a blend of spices commonly associated with East Indian cuisine. The typical spice blend includes turmeric, dried red chilies, coriander seeds, black pepper, cumin seeds, fenugreek seeds, curry leaves, mustard seeds, cinnamon, cardamom, cloves, nutmeg, peppercorns and bay leaves. Curry powders can range from mild to hot, and their ingredients provide not only an array of vitamins and minerals but also a variety of health benefits. 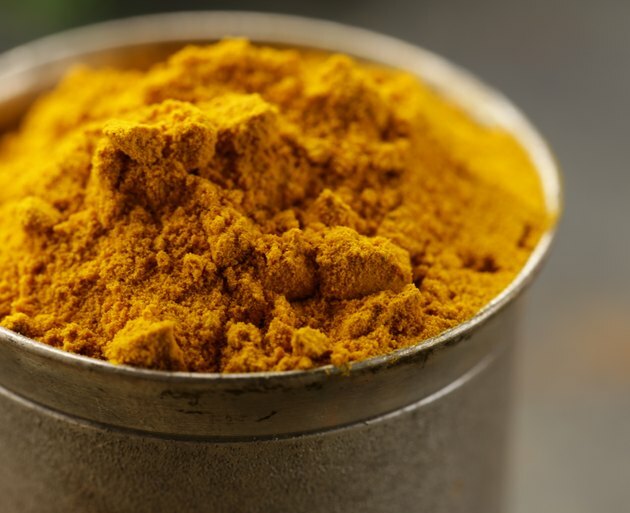 Turmeric, a major ingredient in curry powder, has played an important role in India's Ayurvedic medicine for centuries as a treatment for inflammatory conditions. Curcumin, a component derived from turmeric, has been described as a potent anti-inflammatory agent. An abstract published in "Alternative Medicine Review: A Journal of Clinical Therapeutic" in September 2009 noted clinical trials that indicate curcumin may have potential as a therapeutic agent in diseases such as inflammatory bowel disease; pancreatitis, which is inflammation of the pancreas; arthritis; and certain types of cancer. Curcumin is one of the most widely studied botanicals in the research on cancer. It's safe for human consumption, and is recommended as anti-cancer therapy and to prevent cancer recurrences, according to University of Washington's integrative oncology information for clinicians. An abstract published in "Anticancer Research" in January 2003 noted that extensive research during the past 50 years has indicated that curcumin can both prevent and treat cancer. Curcumin's anti-cancer potential comes from its ability to slow down the spread of a wide variety of tumor cells. Traditional curry powder is filled with spices that help your digestive system. Black pepper, a common ingredient in most curry powder blends, promotes stomach acid secretion and reduces intestinal gas. Bay leaves promote proper digestion. Cinnamon is an antidote for diarrhea, vomiting and upset stomach. Cloves also treat diarrhea and indigestion. Coriander helps relieve stomachaches and treats digestive upsets, and cumin helps with digestive issues. Mary S. Easton UCLA Alzheimer Translation Center: What is Curcumin? University of Kentucky: Spicing Up Your Immune System!